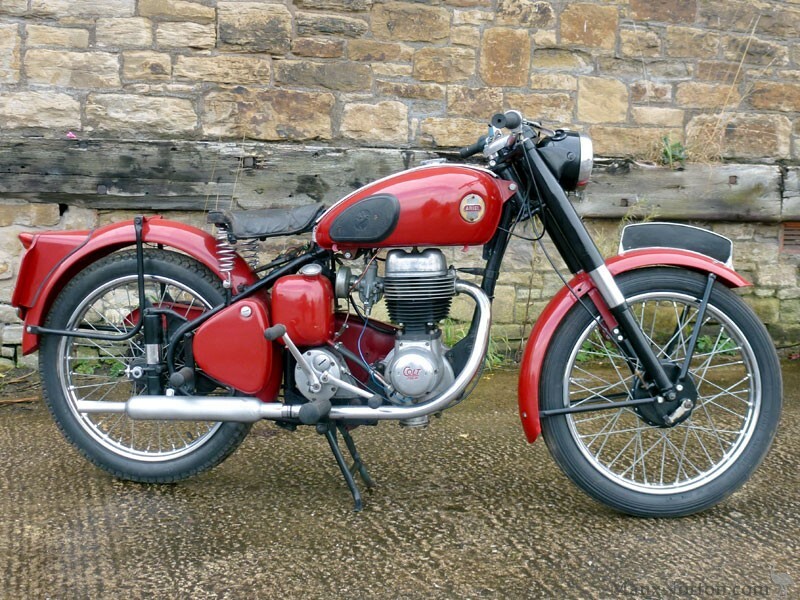 Already looking a bit outdated by 1958 at any rate if compared to Triumph's little Tiger, the Ariel Colt, based on the also ageing BSA C11G, did look to be one of the more robust lightweights of the time, at least around the front end with telescopic, hydraulic forks similar to those on heavier machines. The 197cc single cylinder four stroke engine and oil tank filled the under tank area adequately enough although the pre-unit style cogbox was by then a little incongruous. At the rear end plunger suspension tacked onto the old rigid frame type loops looked a little odd combined with a dual seat atop the rear mudguard, spaces traditionally occupied by a sprung saddle and bumpad. All that said, the disappointing sales figures achieved by the Colt have today given the bike a rarity value not so much enjoyed by Cubs and Bantams making it attractive to the collector of oddities. This at present unregistered Colt has had an interesting life being first supplied in 1958 for an export order. A dating certificate from Ariel specialists Draganfly Motorcycles confirms delivery in standard form with Maroon and black finish to the Ban Chu Bee co. in Kota Baru, Malaya on June 24th of that year. In recent years the bike has been restored to a high standard after repatriation and is presented here in reportedly 'all good' condition and fitted with a much more suitable sprung saddle. Enthusiasts of the Ariel company's products may find this small runabout a suitable garage mate for the more common larger models in the collection.